Emigrants using the Bridger Trail route suffered little from Indian attacks, although some theft of stock by the Crow or Shoshoni was likely if the opportunity presented itself. Several of the diaries tell of peaceful encounters with small groups of different tribal identities, sometimes for trading purposes along the trail. The route west of the Bighorn Mountains and through the Bighorn Basin offered safety from the marauding Sioux. However, once the trail joined with the Bozeman route near the Rock Creek crossing south of the Yellowstone River, the chance of Indian attack increased, although it was not as prevalent as in the Powder River country. "Next morning, to our astonishment, we found that we were within a mile of a large band of Indians who were camped on the creek below us. They had come in during the night. We thought they were hostile Sioux. . . . Major Bridger . . . went with a small company of unarmed men . . . to obtain an interview with them. The chief . . . came with a company of his braves . . . to meet them. Presently the Indians changed their manner, began to shout Bridger! Bridger! . . . and came galloping up. . . . They were Shoshoni, or Snake, Indians from about old Fort Bridger, and recognized our captain as their old friend. They had come across the mountains on a buffalo hunt. The chief was a particular friend of Bridger. . . . The chief's name was Wash-a-kie. This was the only Indian scare we had on the journey." Howard Stanfield was in the second large train following Bridger's. His party had left Red Buttes on May 30, guided by John Jacobs. His train saw no Indians until they were north of the Shoshone River and exiting the Bighorn Basin through Pryor Gap. 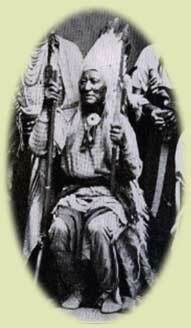 "Our train saw but very few Indians not over fifty on the whole route and they were as polite and civil as it is possible for the sons of the forest to be in their own native home they were of the Flathead tribe." Stanfield's train met the Flathead along the upper portion of Sage Creek near Pryor Gap on June 21. "[W]e stoped [sic] at noon and while there we were visited by about thirty friendly FlatHead Indians both men and women they are the first we have seen since we started on the cut-off. . . . they were the most polite Indians we have seen upon the route they do not beg or steal if you offer them of course they will take it." Robert Vaughn, a member of Joseph Knight's train, recalled passing a large Sioux encampment with no adverse effect. He failed, however, to provide the location of the camp. "One day we came through a Sioux village of eighty-five tepees; there were from two to three hundred Indians, chiefly women and children. On a slope of a hill near by were eight hundred horses in charge of six Indians. Though we camped at noon but a short distance from them, only two approached us, and their actions were different from those of the other Indians whom we had met. When the Sioux came to our camp they would go from one tent or wagon to another in a sullen manner with a contemptible look as if they were going to massacre every one of us, and likely the reason they did not was that we had taken them unawares and before they had time to prepare, besides we were as good as an equal number of soldiers if it had come to fighting." Vaughn's train also encountered a party of Crow while traveling through the Yellowstone River Valley. Except for their renown as expert horse thieves, the Crow were friendly toward Euro-Americans in general. Vaughn remembered that a party of mounted Indians rode up to the train, at which time Captain Knight ordered the train to circle up and form a stockade. "They were eighty-five in number . . . the chief came forward and stated that they were 'Crows' and he wished to know who we were and where we were going . . . They were mounted on good horses and had on their war paint and all were stripped to their waists. We gave them some bread and coffee and took a smoke with them . . . They all left very peaceably and never came back. They were the last Indians we saw until we got to Alder Creek." Two trains, traveling several weeks behind Bridger's outfit, encountered parties of Sioux and Crow along Clarks Fork of the Yellowstone River in southern Montana. Charles Baker and William Atchison were traveling three or four days ahead of William Haskell's train. Both trains encountered Indians while camped along the river. Atchison's diary provides a much more detailed account of the contact than Baker's. He noted on July 11, that "Some of our `Red Skin' brethren of the `Crow' nation camped with us," a fact Baker failed to mention. On July 12, Baker noted that a "great many Indians came to our camp at noon. . . ." A much clearer picture emerges from Atchison's diary entry for the same day. "Here a party of 200 Crow Indians came into the camp for the purpose of trading. We made some excellent trades, - robes, moccasins, etc." Baker and Atchison's encounter with the Crow was much more favorable and profitable than Haskell's train, who undoubtedly experienced some trepidation while camped a few days later. Haskell wrote that on July 16, they "[C]ame onto a large party of Sioux Indians. . . . had no trouble otherwise than that; had to camp on Clarkes' Fork." When Baker's train reached the Yellowstone River a few days later on July 19, they laid over and a party of prospectors sortied out into the foothills of the Absaroka Mountain range. Baker is almost mute in his diary about Indian contact, he simply, "saw Indians"; Atchison, however, wrote that the train "Laid over for the purpose of prospecting . . . About 30 men went out . . . Prospecting party in ascending a deep gulch were met by a party of six hundred Indians and driven back. Thus ends, for the present, prospecting on the Yellow Stone." There is no reference to which tribe chased the prospectors out of the gulch. Due to their recent peaceful contact with the Crow, it seems that it may have been the Sioux, or possibly the Blackfeet. Almost two weeks later Haskell's train was moving slowly along the Yellowstone River to allow prospecting parties to inspect the nearby mountains for signs of gold. On July 29, his train "Drove ten miles up the Yellowstone and found our party awaiting us; wanted more men, too many Indians to venture [safely]; reinforced them with 12 men; the camp has been thronged all day by Crow Indians; they are infernal beggars." No doubt from their perspective, the Crow felt justified in exacting some kind of payment from Haskell's train, and others, trespassing through their territory, lands that had been theirs traditionally, and part of which had been set aside for their occupation and hunting grounds as stipulated in the 1851 Fort Laramie Treaty. In fact the following spring of 1865, the Crow, frustrated by the continued crush of emigration to Montana and the constant harassment of the Sioux, expressed a desire to sell the entire Yellowstone River Valley and go on a reservation, preferably near the mouth of the Yellowstone. 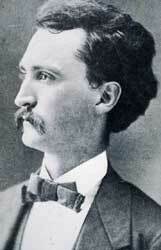 According to Mahlon Wilkinson, Indian Agent for the Upper Missouri, the Crow warned, however, that "Col Bridger's road. . . as well as the proposed roads from the Missouri river pass through their country and should no treaties be made and their present annual supply of goods be stopped hostilities must be the result the Assinniboine would Surely join them." Perhaps the most noteworthy account of Indian encounters by a Bridger Trail emigrant may be that of Tom LeForge. He was fourteen when traveling with his parents on the trail in the spring of 1864, bound for Virginia City, Montana. No date is given for their departure from Red Buttes, but he did write that "our train was not far behind one that was led by Jim Bridger as its guide." It is possible that LeForge's party was part of the ten wagons that made up the party of Independents that followed behind Jim Bridger's lead train. 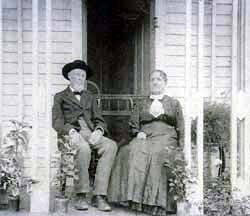 LeForge and his family had two wagons and traveled with traders Gus Beauvais and one Mollette from St. Joseph. While still on the South Platte, LeForge recalled, "Hostile Indians killed people ahead of us and behind us, but we did not lose any members of our party in this way. We attributed our good fortune to the presence of Beauvais and Mollette. . . . A band of Sioux visited us. . . . Mollette knew some of them personally." A war party of Sioux visited LeForge's train after they crossed the North Platte River and warned against traveling through the Powder River Basin. "They . . . made sign-talk with Beauvais and Mollette. . . . if we would go by the `Blanket Road', the Sioux would not annoy us. `Blanket' was their name for Jim Bridger. . . . We traveled the Bridger Road. . . . [Still, LeForge stated that] we had some minor attacks by Indians. One night our night herders were shot at . . . about noon one day a war-party appeared off on a hill to our right. . . . During the entire journey every man kept himself armed and ready for trouble." The first fatalities occurred on the last leg of the trip, when LeForge's train was near the Shields River east of present-day Livingston, Montana. A preacher traveling with the train "protested against the dancing, but with no avail. . . . he became so distressed by . . . the incorrigible wickedness of the company that he announced his determination to go back. The next day he did so, taking with him his son. But they did not go far. News came to us in a few days that their dead and mangled bodies had been found along the trail. Hostile Indians . . . had pounced upon them as easy prey." The Indians responsible for the death of the preacher may have been Blackfeet or possibly Sioux ranging west of the Powder River country and the Bighorn River. Although the train was traveling through a region claimed by the Blackfeet and Crow, it was unlikely that they were Crow. Prior to the death of the preacher and his son, a man named Adams had stayed behind when LeForge's train departed the Stillwater River, several days drive east of the Shields River. "His three wagons were loaded with merchant goods, including a rich cargo of silks." The train was camped on the Yellowstone when Adams returned on foot claiming his wife had been killed by Indians. A body of men accompanied Adams back to search for his wife. They found her tracks by a creek. . . . They found her, very tired and very hungry, but not injured. They then sought the wagons. These they found guarded by a few Crow Indians. . . . the supposed "attack" was by friendly Crow Indians. In the course of their visit . . . one of them playfully displayed his hunting knife. Either Adams or his helper fired a shot that killed this Indian, Sorrel Horse. Then the three whites scattered . . . to get away, with the Crows following after them in an effort to assure them of good intentions. At their request, Adams now gave them presents from his stock, these to compensate them for killing their companion. LeForge spoke of one final encounter with Indians before his train reached its destination in Montana. "We met a band of Nez Perces on the upper Yellowstone River. They had come over the Rocky Mountains to hunt buffalo in the Crow country, they being friendly with the Crows and both tribes being on good terms with the whites. In this band was an Indian from some tribe in Kansas who had married a Nez Perces woman. . . . My father had known him in Kansas, had served with him in the army, and this renewal of acquaintance helped greatly to ease our minds as to possible Indian trouble."